Zombies in media are always a hit and continue to see constant releases year after year. The video game industry is no exception with developers hoping to terrify players as they approach the undead. From gnashing teeth to the long hungry groans for human flesh, there are all sorts of zombie titles available on the PlayStation 4 platform. However, instead of opening up the entire catalog of video games available for the PlayStation 4, we want to take a look at some of the more recent releases. In this list, we are giving readers our picks for the best zombie titles to have released on the PlayStation 4 within the last five years. You’ll find all sorts of video game titles below that range from remasters to brand new IPs. Without further ado, these are the best and most recent undead zombie and zombie-like games for the PlayStation 4. I believe Dead Island really grabbed the attention of gamers everywhere through its announcement trailer. Developers Techland and publisher Deep Silver delivered a trailer that would likely go down into the history books as we watch the demise of a little girl becoming infected in reverse. The video game plays a bit like Left 4 Dead if you’re familiar with the series. Players can choose one of four playable characters who is found trapped within a fictional island known as Banoi. Overall, this is a luxury island that just happened to be ground zero for the zombie pandemic outbreak. Gameplay is a bit more relaxed in comparison to titles such as the Resident Evil franchise. There’s a heavy emphasis on melee attacks against the undead as you roam around the island completing quests in order to find a means of escaping. Also, just like Left 4 Dead, Dead Island is best played with friends online. Though the first title was a success, publisher Deep Silver has yet to launch a sequel. Instead, we’ve seen a standalone DLC release known as Dead Island: Riptide and a spin-off title known as Escape Dead Island. Thankfully those expansions are bundled together in this edition. Capcom sure loves their zombie titles as the studio not only has their staple Resident Evil franchise but the Dead Rising series as well. Gamers may see Resident Evil as a more serious approach to an undead zombie pandemic narrative campaign, but Capcom offers gamers who want more of an action-adventure experience with Dead Rising. Currently, the latest installment of the series is Dead Rising 4 which is known as a survival horror beat ‘em up video game that is a more or less open world. Players in Dead Rising 4 takes on the role of a protagonist named Frank West who first came into the scene in the very first Dead Rising video game. In the narrative, Dead Rising 4 takes place in 2022 where Frank West acts as a college professor who is convinced to follow a student toward a rural area of Colorado. In their journey, the duo discovers a military compound is using the base as zombie research. Frank is then considered and marked as a fugitive who once again gets swept into saving the day after a zombie outbreak strikes. As mentioned, the Dead Rising series is more focused as a beat ‘em up where players can melee attack hordes of zombies with a wide variety of weapons. In fact, the game series does offer the ability to make custom weapons out of random parts discovered about. Killing Floor 2 is aimed more at cooperative gameplay in this FPS survival horror title. Players will find that Killing Floor 2 takes place just a month after the events of Killing Floor where the bio-tech pandemic has spread rampantly. Within the game, players will be forced to fight off Zeds, which are various zombie-like creatures. This is a wave-based gameplay style where you’ll be fighting off stronger and increasing amount of Zeds after each wave. There’s also boss fights to battle through, each of which will be centered around their own strategies and attributes. As mentioned, this is a great game for multiplayer where groups of players can join in a match and attempt to survive the relentless Zeds wave after wave. Overall, reception of the game was positive with players enjoying the old school survival horror feel when other long lasting franchises such as Resident Evil was moving towards an action oriented gameplay. The Evil Within eventually granted developers to continue on with a sequel. Within the game, players are taken to a small time jump of just three years after the events of the first installment. Again, much like the first installment, players will be stepping back into the role of Sebastian Catellanos who is on another grand investigation. This case will however ties loose ends of Sebastian’s past. As you battle against grotesque creatures in search of clues, you’ll learn more about our protagonist and his past. Currently, this is the last installment released from The Evil Within series though it does appear that we will see a third installment but there’s been no details regarding just when the game will finally make its way to the market. Dead Rising is a bit different than the average zombie focused video game. Instead of cowering away for cover and avoiding the undead, developers Capcom tosses you into the forefront in an open world beat ’em up style gameplay. The game follows Frank West who is a freelance photographer that goes above and beyond to capture photos of events such as wars. Following a few leads, Frank ends up at Willamette, Colorado. Soon trapped in a massive mall, Frank must battle his way out of a horde of zombies, though defeating these undead walkers is easier than you think. As mentioned, this is a beat ’em up style video game and being set in a mall, there are countless items you can grab in order to smash and bash your way through the horde. Released original on the Xbox 360, Capcom has went back and made a collection pack for gamers on current generation platforms. Dead Rising Triple Pack will not only include Dead Rising, but it will also come bundled with Dead Rising 2 and the expansions. Call of Duty has been a popular franchise for a number of years, though with the introduction of a zombies game mode, there are plenty of gamers who pick up select titles just to enjoy fighting off the undead. The game mode first appeared within the Call of Duty: World at War title and has since been included in a number of installments afterward such as through the Call of Duty: Black Ops series. Overall, this is a wave-based game mode where players will have to fight off the undead horde in growing numbers as they complete each wave. Likewise, the maps available will require players to gain points through killing zombies in order to unlock additional sections to explore. Being a Call of Duty title, another emphasis is gaining weapons by purchasing them through points earned while also stocking up on perks and setting traps to use as an advantage against the enemy. As mentioned, there are a number of Call of Duty installments that offer a zombies mode with one of the latest being Call of Duty: WW2. Plants vs. Zombies: Garden Warfare 2 is a zombie title that is perfect for a younger audience. A spinoff from the original Plants vs. Zombies video game, Garden Warfare 2 mixes together tower defense and third-person shooter elements. Much of the same mechanics and gameplay from Plants vs. Zombies: Garden Warfare is present, but the sequel does add a few new classes and modes. Through the game, players will be battling each other in both single-player and multiplayer game modes. You’ll find the usual game modes for third-person shooters such as a king of the hill style match and team deathmatch variants. All-in-all, if you’re looking for a lighthearted game to enjoy that is suitable for young gamers then this would be a worthy pickup. Resident Evil is an iconic video game title and one that helped pave the road for future survival horror titles. Currently, the original title of the franchise does not hold up well today though luckily, the development team over at Capcom has released remastered editions over the years. The latest release was in 2015 where the game received a 1080p resolution along with 5.1 surround sound. Likewise, if you’re not familiar with the days of the original Resident Evil then chances are you won’t like the control scheme. Often considered as “tank controls” Capcom has changed the controls to make movement a bit more fluid with the analog stick. If you have yet to play Resident Evil then you’re missing out on not only a classic title but one that spawned an entire franchise. Likewise, in this Origins Collection of Resident Evil, you’ll also receive Resident Evil Zero. This is a prequel to Resident Evil where players control Rebecca Chambers and Billy Coen, a duo that ends up trapped around Raccoon City. There are some slight differences between Resident Evil and Resident Evil Zero. Capcom had dropped the chest storage system forcing players to remember where they dropped certain items around the map. Likewise, there is a new puzzle mechanic in which players take control of two characters, switching back and forth between the two in order to progress or reach certain areas. Resident Evil 4 was a pretty big change in comparison to the past main installments. Within the game, players take the role of Leon S. Kennedy who is sent out on a mission to recover the president’s daughter Ashley Graham. This takes players to a rural area of Spain where most of the villagers are cursed with a virus that turned them into zombie-like creatures. Mechanically, the gameplay was the drastic difference with Resident Evil 4 and despite being a risky move for the franchise, the reception to the gameplay was overwhelmingly positive. Losing out on the “tank” style controls, Capcom opted to bring players more into the action by giving an over-the-shoulder view that not only helped in maneuvering around the map easier but combat was fluid. Developed and published by Capcom, the long-running survival horror franchise Resident Evil should be no stranger to gamers. However, over the years, we have seen the franchise take a slight turn towards its humble roots of being a survival horror title. Instead, the franchise began to experiment with a more blockbuster action-packed experience, though that’s since changed with the latest installment. 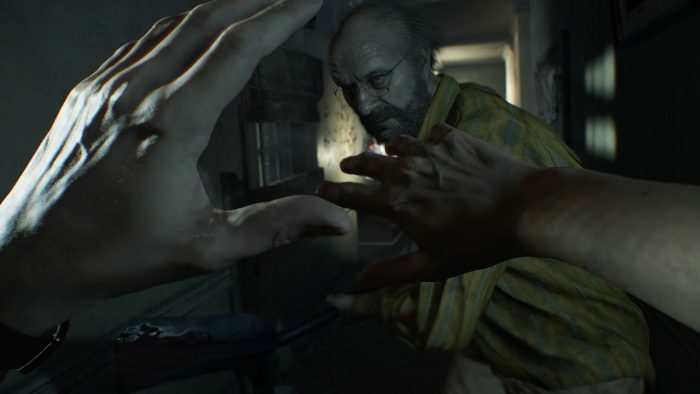 Resident Evil 7 takes players back to the terrifying atmosphere in a first-person perspective, which is a bit unique compared to the third-person gameplay style the series is known for. Regardless, players take on the role of a new protagonist, Ethan Winters, who finds himself trapped in a psychotic family at a derelict plantation. Determined to find his wife Mia, Ethan Winters dabbles deeper into the Baker family in order to uncover what’s going on and just how this family is connected to the disappearance of Mia Winters. As stated, since this title takes players back to a more atmospheric survival horror experience that Resident Evil first started out as, players shouldn’t expect too much action. Instead, there will be a focus on surviving your surroundings and solving puzzles. With that said, there is DLC which will star Chris Redfield, a staple character from the franchise which should provide a bit more action to the title along with connecting the game to previous Resident Evil installments. The Walking Dead is a world phenomenon in a wide assortment of mediums. Starting out just as a standard monthly comic book series, the story has been adapted into a drama television series and then into a video game franchise. Arguably the strongest series of The Walking Dead video game franchise is the series developed by Telltale Games. If you’re familiar with Telltale Games then we really shouldn’t have to say much more. The development studio takes great care with whatever franchise they happened to be working on, essentially establishing a new narrative or an in-depth retelling of a story that will undoubtedly draw you in. Telltale Games The Walking Dead definitely offers fans of the comic book or television series a fresh new narrative filled with hard choices and gameplay mechanics easy enough that even the most novice gamer could grasp without going through an overwhelming learning curve. There are a total of three titles within Telltale Game’s The Walking Dead series and a fourth, which will make the final installment, is currently in the works. We won’t dare spoil the narrative which is the strongest aspect to any Telltale Game, but if you enjoy The Walking Dead and want a new interesting story with fresh new characters then you’ll be amiss not to pick up the series. Capcom has been an iconic video game development studio over the years and its brought out some incredible IPs. One of which was Resident Evil, a title we definitely feature heavily here on this list and as iconic as this series is, there was no surprise when the development team decided to handle remakes. Unfortunately for gamers, most of the remakes were spent on the original title and while that’s not a bad thing, for fans of the series, there have been plenty of vocal pleas for developers to bring out a remake of its sequel, Resident Evil 2. Well, it took a few years but Capcom did just that and delivered gamers a remake of Resident Evil 2 for current generation platforms. This remake does exactly what Capcom did with the original installment. This iconic zombie title was brought out with a massive improvement to the graphics division. Gamers were treated with a video game that looked as if it belonged to the current generation platforms. Likewise, there were some other notable changes to make the game overall play better today. For instance, Capcom ditched the old school tanked controls and instead tossed in the mechanics you would normally find in today’s third-person titles. Furthermore, another change that was potentially controversial for fans of the original title was the removal of its classic fixed position cameras. Gamers were instead given the over-the-shoulder viewpoint, bringing players closer into the action. As for the narrative, luckily Capcom opted to make it the same where players are still taking on the role of Clair Redfield and Leon Kennedy. Stuck in Raccoon City after it’s become over infested with zombies, the duo must work together in order to escape.